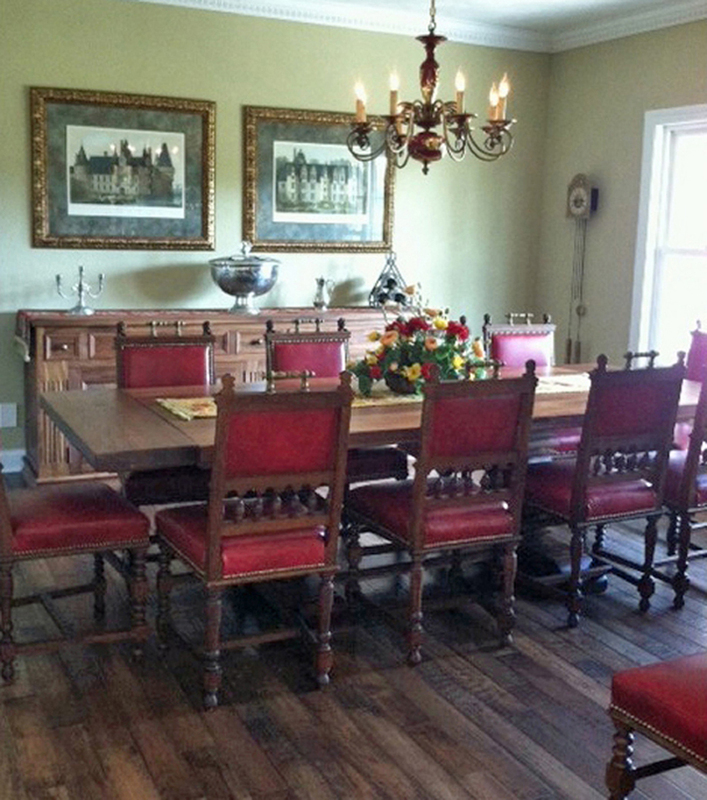 We recently mentioned that our client Susan D. in Metamora, IL, bought a set of twelve dining chairs from us for her Renaissance dining room. 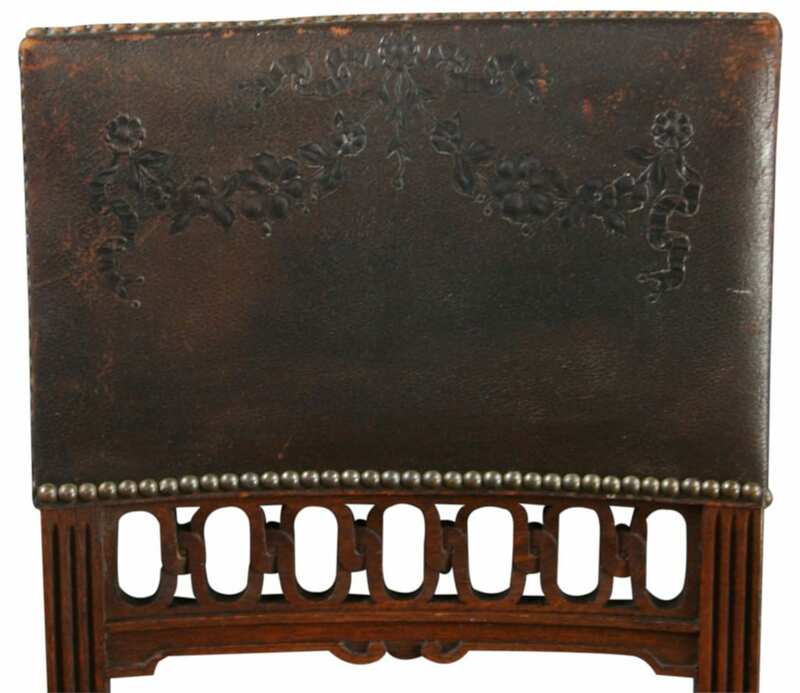 In that Antique Chair Upholstery Makeover post, we said we sometimes find vintage or antique chairs with a beautiful frame but the upholstery is worn. 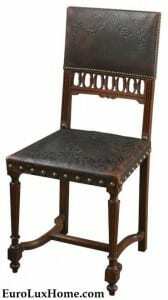 These chairs provide a great opportunity to our customers to update the upholstery to suit their own décor and taste. 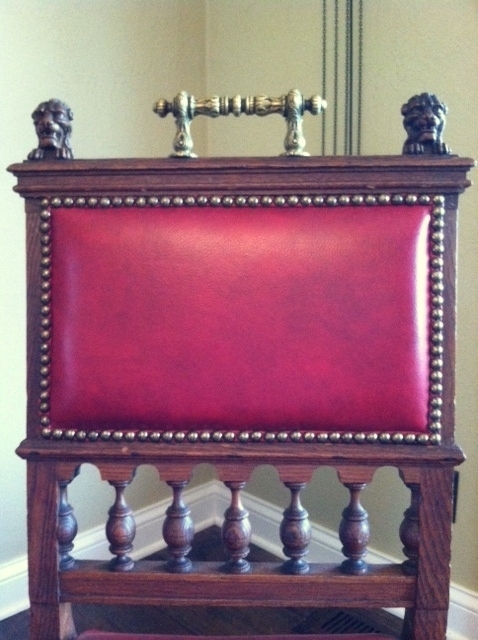 Or they can just reupholster the antique chairs in the original style to give the chairs a new lease on life. 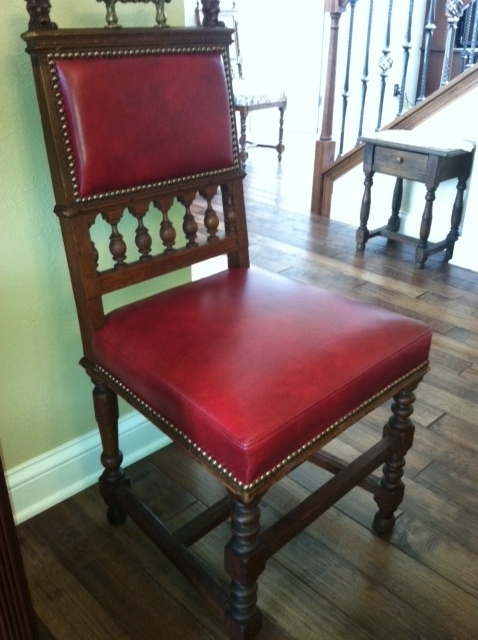 This is exactly what Susan did so beautifully with the Renaissance dining room chairs dating to 1900. 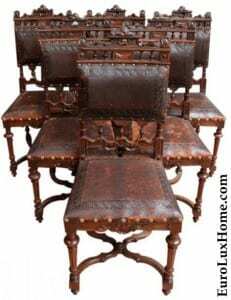 Seven of the twelve chairs needed new upholstery. 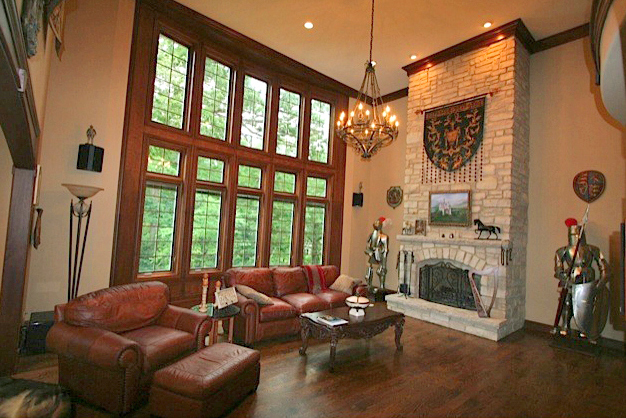 As you can see, Susan did a great job and she also bought a vintage chandelier from us. Now she has sent us more photos of her handsome red Renaissance dining room with the chandelier hung and all the finishing touches in place. What a feast for the eyes! 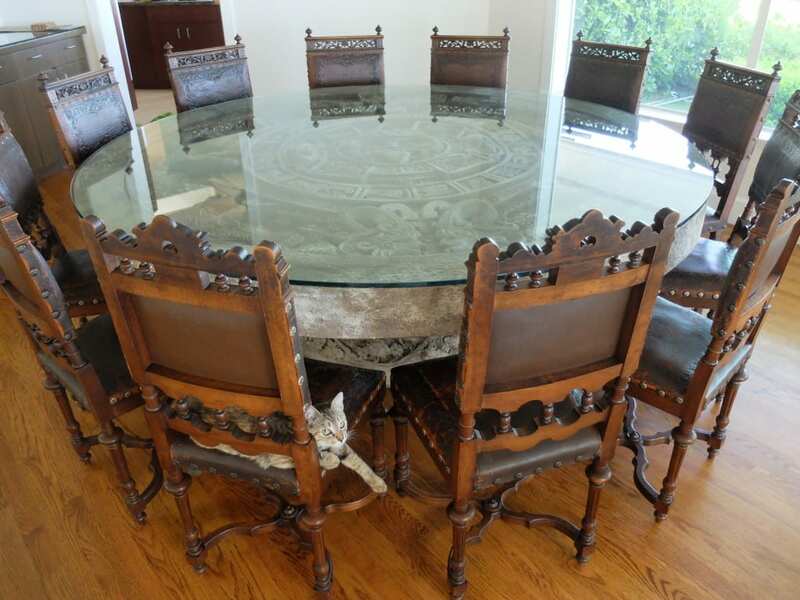 The Belgian oak chairs feature regal lion carvings and metal handles and they look terrific around her dining room table. 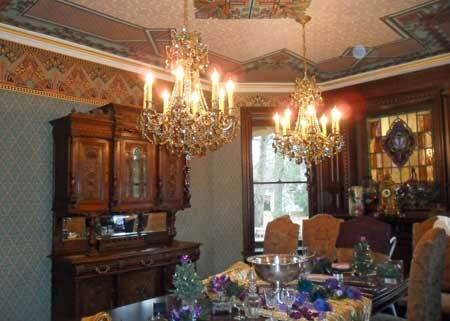 The formal Renaissance dining room looks welcoming and opulent. It’s a wonderful example of décor that evokes the spirit of the original Renaissance Revival style, popular more than a century ago. European nobility and wealthy families loved the classic Renaissance aesthetic that first flourished in 15th century Italy. 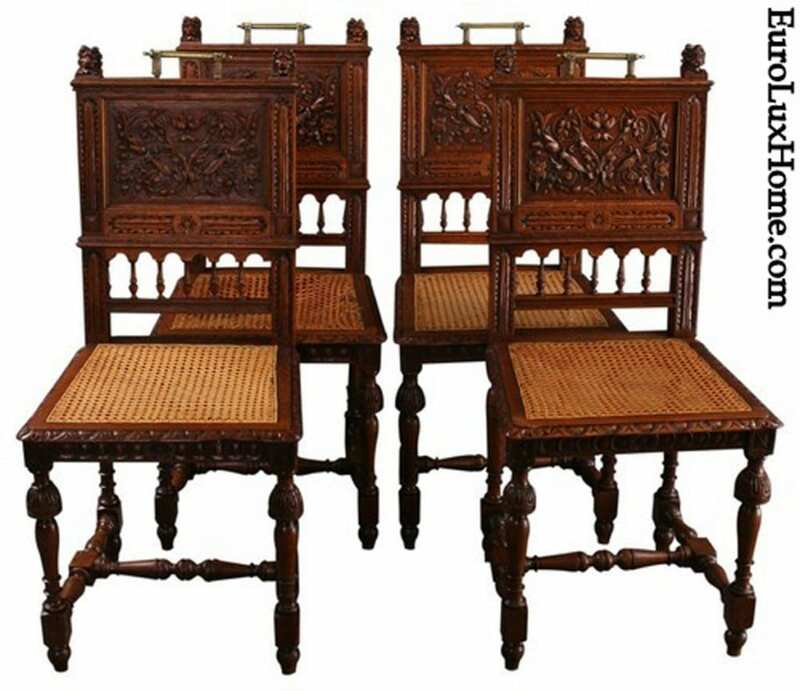 So they filled their homes with impressive and heavily-carved furniture crafted in that style. That’s how these fine chairs came into creation! 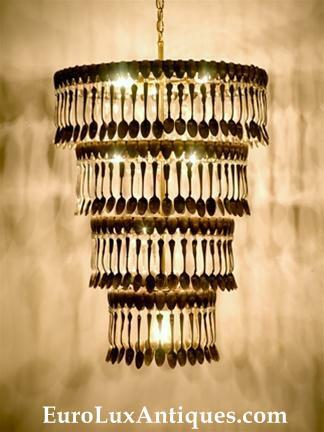 The vintag e Hubert Bequet chandelier Susan chose from our collection of vintage lighting suspends over the dining table. 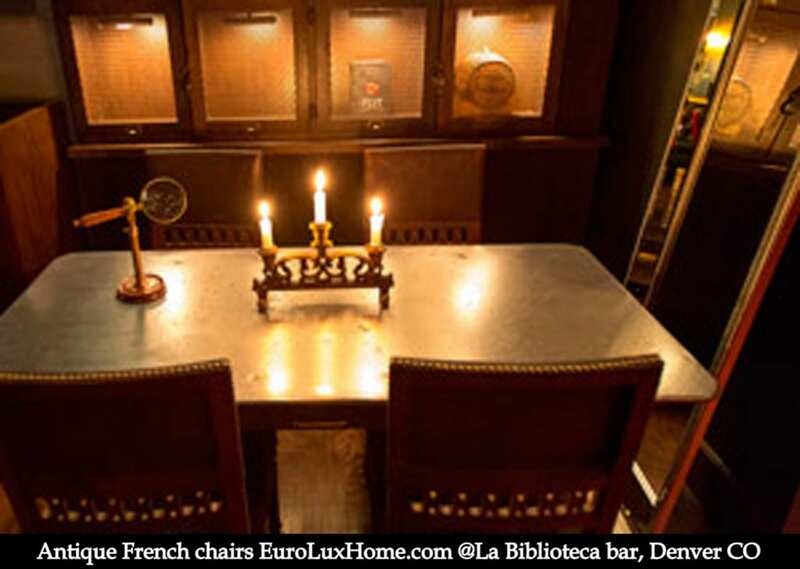 Also from Belgium, the 1950 burgundy chandelier fits perfectly with the Renaissance dining room décor. At two feet high and two feet wide, the scale is just right for the dining table. 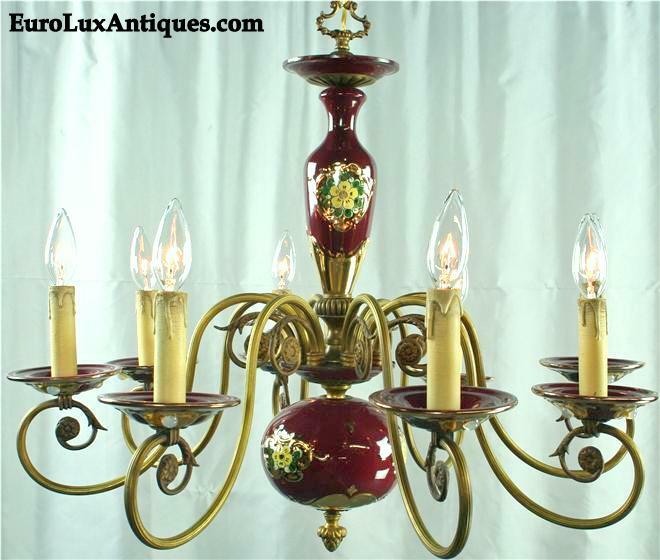 The Bequet chandelier has a sculptural ceramic body and the wine red color, painted with a floral design, looks warm and rich in the red dining room. 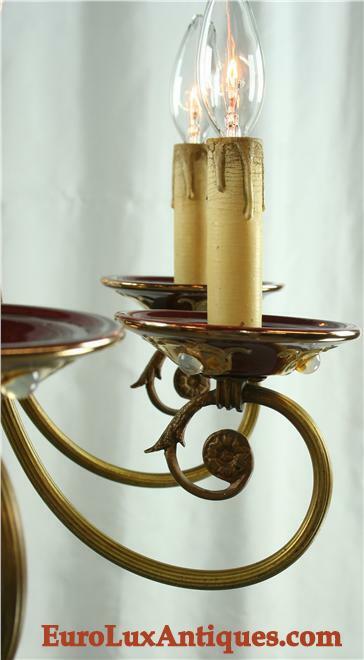 Each ceramic candle cup on the eight metal arms is adorned with glass beads for a jewel-like effect. 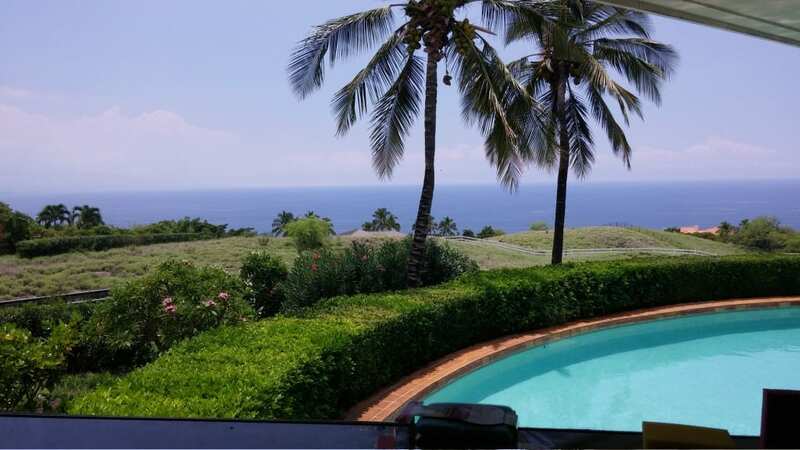 Lavish and lovely! 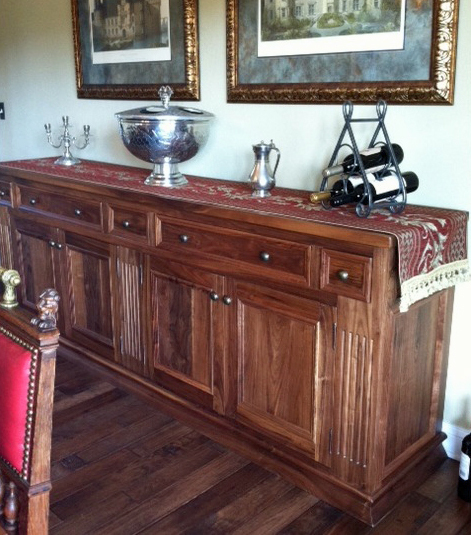 Susan has decorated her sideboard with a tapestry style runner that enhances the authentic air of the Renaissance dining room. 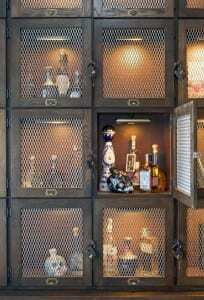 The wine rack, candelabra, pitcher, and punch bowl add more touches of antiquity to the room décor. They are also practical when Susan is entertaining. Red is a classic choice for dining room décor as it stimulates the appetite and conversation. 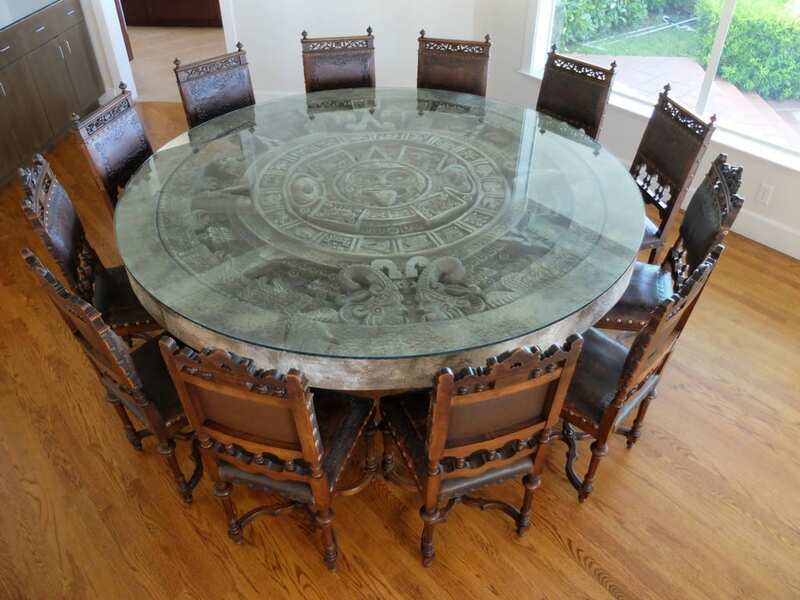 Renaissance dining room furniture always inspires a mood of gracious hospitality. 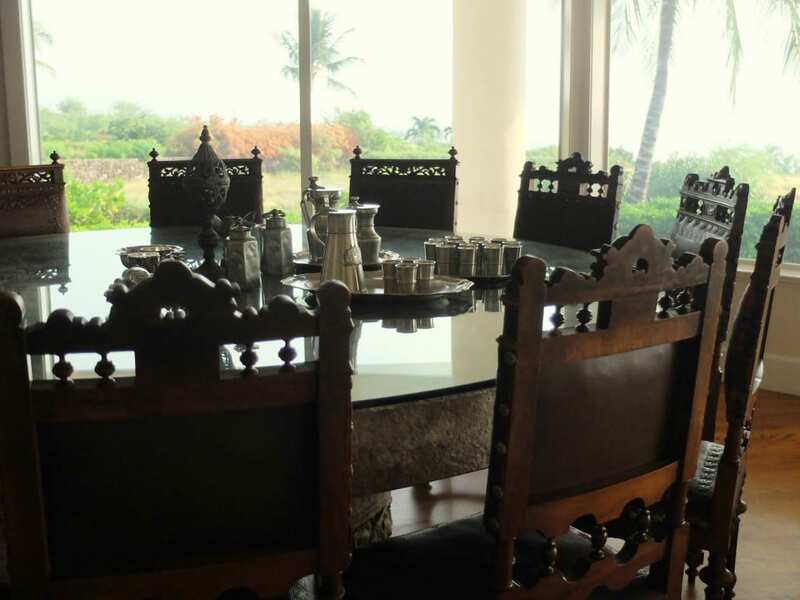 By combining the two, Susan has created an inviting room that we are sure will be the venue for many elegant meals. If you’re tempted by this splendid Renaissance dining room, give in to temptation and browse the selection of antique Renaissance style furniture in our gallery! 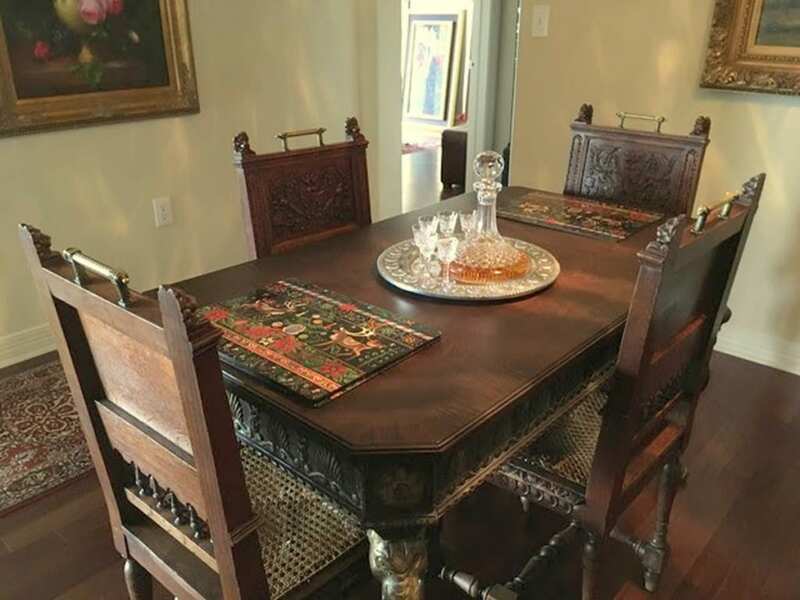 This entry was posted in Antique Furniture, Client Spotlight and tagged antique chairs, Belgian antique dining chairs, chandeliers, dining chairs, red, red dining room, Renaissance Chairs, renovation, upholstery, using red in rooms, Vintage Chandeliers on September 17, 2013 by admin.